It’s been a while since we arrived home from our U.S adventure, and while I had every intention of continuing to post regularly, those good intentions got sucked up by the scary-noisy vacuum nozzle that is the pre-Christmas lead-up. Work got crazy. Weekends were packed out. And amongst all of that, I got busy working on a very different project. The truth is, we brought more through Customs than we officially declared, and I’m not talking about an antique rug from New Mexico that we most certainly did not purchase, wrap in protective plastic and bury in our luggage beneath a pile of cowboy boots. No siree, Bob. We are having a baby. Or potentially a large fruit salad, if the endless fruit-size comparisons on the internet are anything to go by. Mini-Clegg is currently at navel orange stage. Or, as one of my favourite pregnancy sites puts it, he/she is ‘the size of a ramekin of tartar sauce’. Now I’m in my blessed second trimester and, as most sources promised, the queasiness, fatigue and ferocious emotional instability are finally levelling out. Despite having had family members and friends go through pregnancy, I didn’t really know what to expect from the first trimester, other than what the books/websites outlined. But my, how they sanitise things. In fact, reading about what to expect from the first trimester is kind of like getting on an earthquake simulator at Questacon prior to living through an 8.5-on-the-Richter-Scale on top of a New Zealand fault line. My husband would probably (and justifiably) add some Exorcist-style head twisting and There-is-no-Dana-only-Zuul devil-speak to that analogy. In fact, crying was one of the first things that tipped us off at the start. Mostly because I did it for no reason. For an hour. In the bath. In New York, in the middle of the afternoon. It was like a pop-up stage performance of ‘Girl, Interrupted’ in our hotel bathroom. Don’t I know how to show my husband a good time? Since then, I’ve cried watching Youtube (admittedly – dog videos). I’ve cried eating chicken – for absolutely no reason. Crying in the bath is standard, presumably because mini-Clegg wants me to add some cold. I’ve cried browsing the Bonds clothing website. I’ve cried because it’s more than 30-degrees outside. I sobbed – actually sobbed – when my trolley hit one of the fruit stands in Coles. Special thanks to the guy who left his sons with the trolley to come over and ask if I was okay. When I choked out that I was pregnant, a look of comprehension/amusement/fear dawned on his face, as if he was thinking ‘Christ…I remember this‘. But he was kind to the crazy pregnant lady. And despite my rational internal voice telling me to STOP.CRYING.CRAZY WOMAN, I cried all the way to the self-checkout. I completely lost it while scanning my items and paying, and continued all the way home. Yup, I became the crazy person I try to avoid on public transport. A male friend of mine once told me a story about how his pregnant wife cried because he cooked the bacon the wrong way. At the time I laughed – now I wish I’d kicked him in the shins and revoked his bacon privileges. Note: The crying may not be over completely. I just cried a minute ago watching this clip on YouTube. You’re tired, listless, queasy and you’re not sure if eating will improve things or actually kill you, because your stomach behaves like a moody teenage girl now and SHE DOESN’T WANT TO TALK TO YOU, OKAY? YOU WOULDN’T UNDERSTAND ANYHOW. But even if you do get a clear message that you are, in fact, hungry – you don’t want a bacon and egg roll. Or a greasy burger. Or cheese. Or nice, slow-energy-releasing wholegrains (HA! AHAHAHAHAHAHA! Oh good God no). No, you want chicken nuggets. Specifically the oven-cremated chicken nuggets the Goulburn North Public School canteen dished up in those little brown paper lunch bags in 1991. That’s it. That’s the one thing you want to eat today, and if those nuggets don’t show themselves, there’s going to be a bath with crying in it. Cruskits, Country Cheese, Peckish (Plain through to Cheese, Sweet Chilli and Barbecue) and Saladas were my constant companions. Not because I enjoyed them, but because they’re the food equivalent of undercover agents; your stomach is deceived into accepting them because they resemble box packaging. So when my teenager-temperment-stomach revolted at the prospect of anything, but I had to either eat something or forgo consciousness – I’d smash a handful of the crackers that I’d put in the pantry/my bag/the glovebox/on my desk/in my bedside drawer. I’ll never forget sitting on the couch at 2.30 in the morning (teenage-girl stomach doesn’t care about your beauty sleep), trying to chew quietly so as not to wake anyone up while sharing a pack of Country Cheese biscuits with the dog. He loved the first trimester. They’re not kidding about the peeing. Again, this was one of the first signs that I was pregnant. The afternoon before we found out, I did a mad dash through the French Quarter of New Orleans, desperately searching for a public restroom. We eventually located a random, dilapidated Portaloo in the middle of one of the backstreets. Just what the pregnant lady ordered. You really do have to go all the time. In fact, by the time you’ve peed and washed your hands, you’re probably going to need to go again. And there’s no ‘kind of need to’ anymore. You either don’t need to go, or you’re desperate to go RIGHT NOW. Eat a dry Cruskit. Give the dog one because he looks sad. Exhausted from both peeing and chewing. Lie down. Threaten stomach with avocado to dampen hunger. Eat a Cruskit while crying at something on the news – possibly a singing dog viral or stock news footage of an old person sitting alone on a park bench. Or maybe the weather radar just looked at you wrong. Whatever. At around 8.30am I’d break the cracker cycle with a banana, another fantastic decoy device my stomach didn’t seem to revile . But the need to pee every 20 minutes would continue throughout the day. Silver lining: I have a comprehensive mental map of all known public restrooms in the Sydney area. People are going to say some really stupid things. I’ve worked in advertising – an industry renowned for its inappropriateness, sexism, nepotism, competitiveness and general wankery – for nearly 10 years now. It’s not all bad – in fact it’s usually heaps of fun and a hell of a lot more enjoyable than data entry or shovelling dirt – but you cannot survive or get ahead in this industry without developing and maintaining a seriously thick skin. Especially in a creative department, where your boss is usually paid a lot of money to inform you when and why your ideas are complete turds. So when I was told to expect some insensitive responses and unwanted advice in regards to the pregnancy, I kind of figured I’d be able to shrug it off just fine. Water off a duck’s back and all that. To quote Obi Wan Kenobi: I was wrong. The problem is that the early weeks and months of pregnancy strip back your defenses without you realising, leaving you extremely vulnerable to all external input – kind of like a naked snail. Which, when you think about it, is pretty much a slug. You’re a cracker-munching, crying slug with a bladder problem. By the time the second trimester rolls around, you’ve gained back some of your protective shell (and sanity… and basic ability to rationalise), and find it far easier to shrug off the stupid things people say. You start to realise that most of it stems from either misguided good intentions or complete cluelessness about how to respond appropriately to your news. Yes, some of it stems from a bad case of the dumb/insensitive, but you can’t do much about that. And the truth is – I’m fairly certain that pre-pregnancy, I said some dumb/insensitive/thoughtless things and offered up ill-informed advice to pregnant friends and family members too. Not out of a desire to be unkind or bossy, but because I was excited and didn’t know any better. Now I do, and I kind of wish I could blanket-email them an apology. Of course, all of the less-than-stellar stuff above is counteracted by the awesome part: the ultrasound. It is actually a more mind-blowing moment than fictional TV pregnancies prepared you for. Some women cry but I couldn’t stop giggling (joyful giggling, not creepy horror movie giggling, in case you’re wondering). 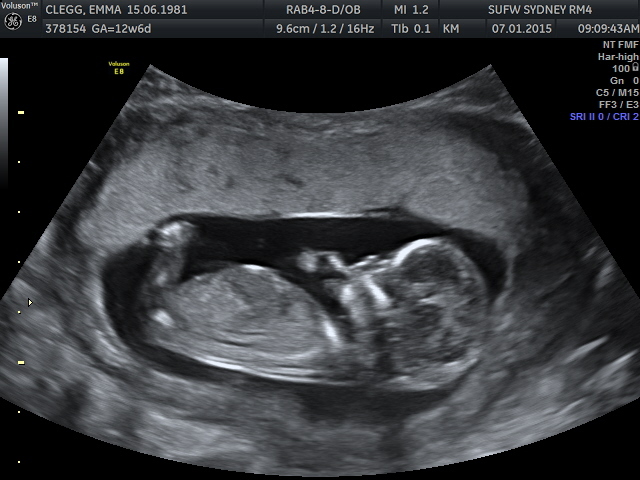 This of course ruined the ultrasound image, but the brief first glimpse of our future offspring was worth choking down a thousand dry Cruskits. Even if they did resemble a chicken nugget…that’s just a coincidence, right? Next For Chewie, Our Good Boy.